This post is brought to you by Capital One. 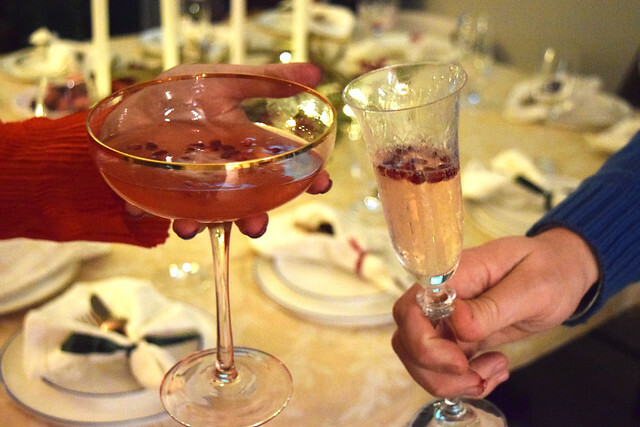 To me, the holidays are synonymous with giving back, spending quality time with our loved ones, and indulging. It’s not lost on me, though, that the holidays can also be synonymous with stress: deadlines, crowded airports, traffic delays, squeezing in time with people you haven’t seen in a year, finding gifts for loved ones, and dodging hot button topics with, well, everyone. It can be a lot to juggle. 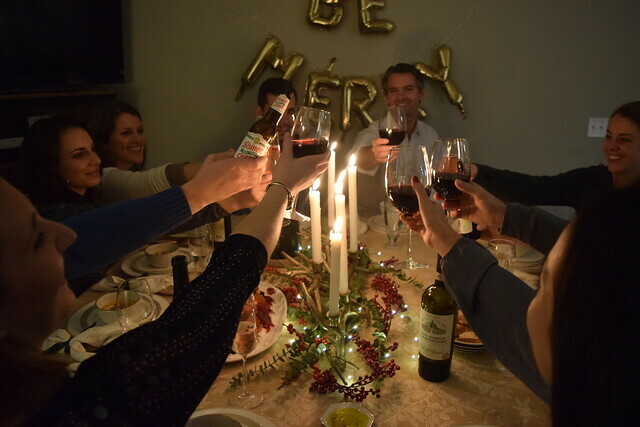 As a way to decompress and spend quality time with the people we love, my now husband and I started a tradition where we host an annual holiday party for our close friends. One of our favorite ways to reflect on the past year and toast to the new one is in the comfort of our home surrounded by friends. 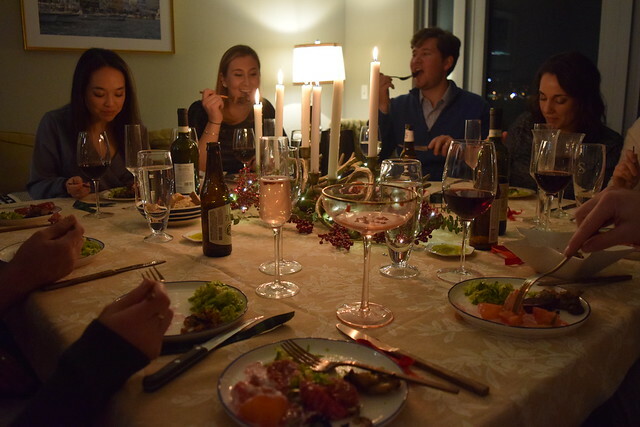 So, instead of bestowing individual gifts to people, we open our home in these cold winter months as an excuse to lean into festive traditions, which tend to take place around the dinner table with friends. Be it in the kitchen, by way of an annual holiday card, a special tree trimming ritual, or by toasting to friends at an annual party, I’ve always prioritized carrying on family traditions and implementing new ones, no matter how crazy this season can get. As someone who works non-stop year round, I find it perfectly acceptable to reward yourself during the holidays, as well. Prioritizing self-care, or grabbing a few small gifts that you’ve been eyeing while holiday shopping for others is a ritual I’ve embraced the older I get. This year, we gathered around the table with some of our closest friends to celebrate Capital One‘s new SavorSM card, a product that rewards you for sharing memories and making new ones, with 3% cash back on dining out, and 2% cash back on groceries. We’ve always enjoyed cooking and hosting together, but the SavorSM card can help make the festivities even more rewarding. And really, the holidays are just the beginning of entertaining season with awards season and big sports championships on the horizon, it’s the perfect time to get rewarded for spending time with friends. 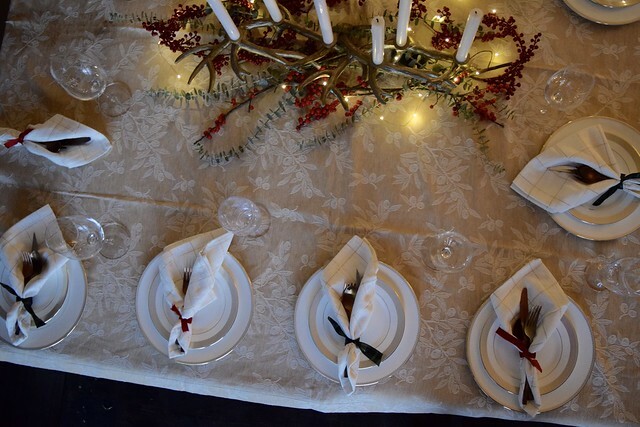 Here are some ideas to inspire you to gather around the table this holiday season. Sometimes, when you decide to host a large gathering of friends, spending time with your co-host (significant other, roommate, best friend) may get lost in the shuffle. Each year, before we host our annual Holiday dinner, my husband, Gavin, and I turn the preparation into an unconventional date night, where we shop, stay in, cook, and watch holiday movies together. We usually have a pretty good idea of the type of food we want to serve our guests, but we use the trip to the grocery store to develop our menu together–walking up and down the aisles each pretending to be top chefs developing their newest award-winning dish. We always seem to end up with more food than we need, which is why we’re excited that you can earn 2% cash back on groceries through the Savor Card, so you don’t need to feel guilty about filling your cart. Because so much preparation can be required when you’re hosting, we like to make our own tradition of doing everything we can together, and making it as fun as we can. For us, two cooks in the kitchen is better than one. I like to find one recipe that I’ve never cooked before, that will also be memorable for our guests. For Gavin, it’s undoubtedly a sous vide beef tenderloin. 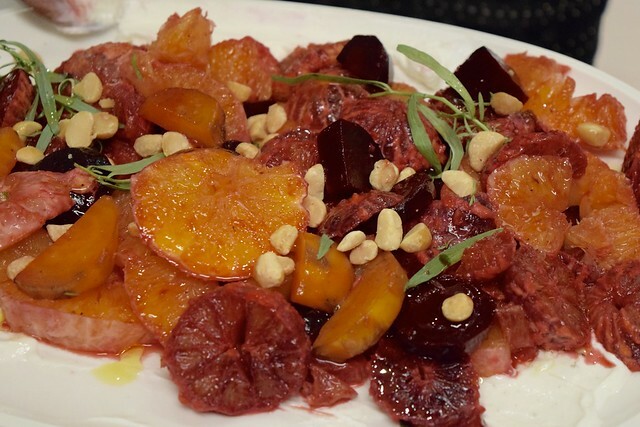 For me, I went with this Blood Orange, roasted golden beets, tarragon, yogurt, and hazelnut salad. At this point, we have a pipeline of entertaining crowd pleasers that we’ve mastered; prosciutto wrapped dates, crostini, and shaved sunchokes, to name a few, but it’s always fun to change up the menu based on the season and the occasion. If you’re hosting a dinner, there’s no need to feel pressure to also bestow gifts onto your guests. 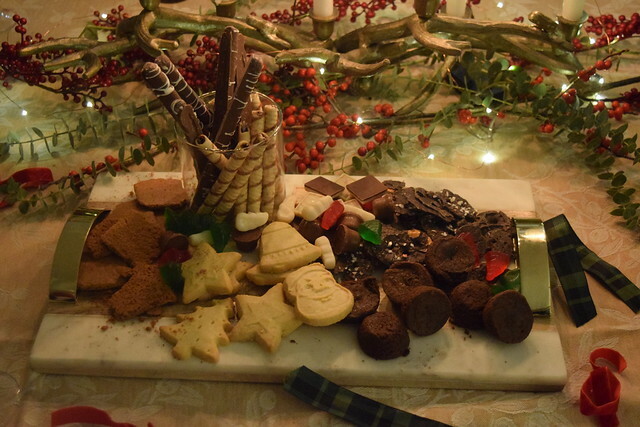 However, you can engage your guests and add another festive activity to the agenda. While a secret Santa or a white elephant exchange can be fun, I find them to be more daunting than anything. Instead, ask everyone to bring a $10 and under gift for a pup or baby (at this stage, my friends have at least one or the other) and exchange them like a grab bag. There’s nothing parents love more than spoiling their little ones. Alternatively, if you have a charity that your group feels passionate about, you could also consider donating on behalf of each guest and surprising them with a note or by way of a toast at your party. A festival tablescape can be a small way to make a big impact on the aesthetic of your party. This year, I was inspired to go with a woodland theme after picking up two gorgeous gold antler candelabras. 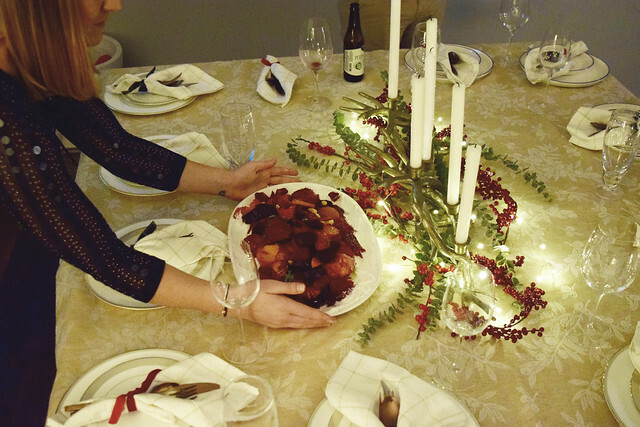 I wove berries (fake ones work just fine), eucalyptus, evergreen scraps—free from the tree lot below our apartment!—and delicate starry lights to the centerpiece to really make it the focal point of our gathering. I’m a firm believer that lighting is critical to the vibe for any party.